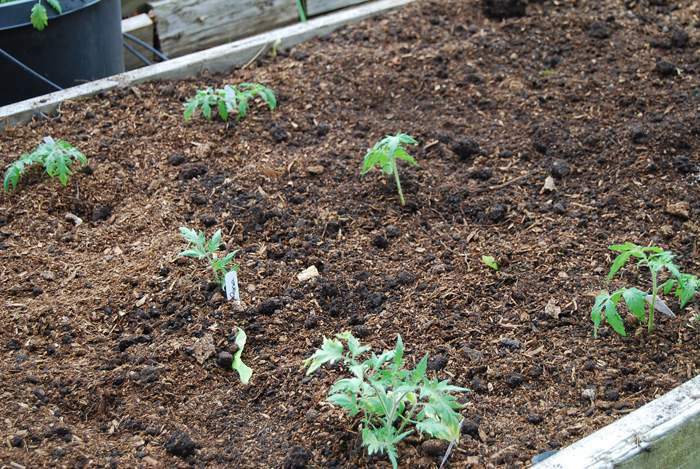 When planting my tomato plants I used to just dig a whole plop them in and let them grow. It usually worked out just fine and they would produce well. But then I had a friend of mine tell me about trenching the tomatoes when planting them. 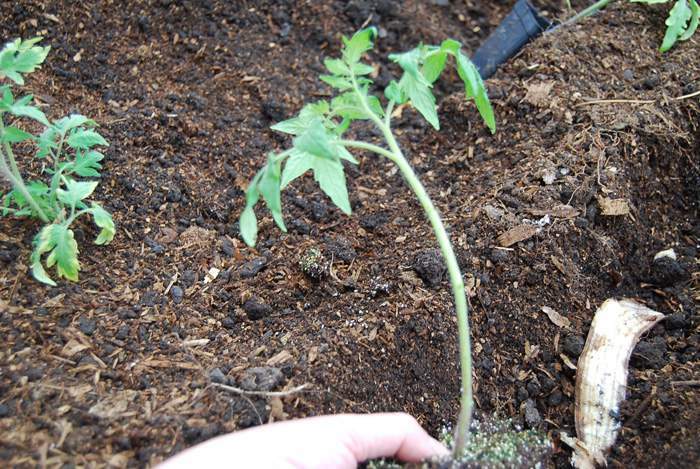 By trenching the tomato plants you get more roots to grow to supply the plant above the ground. 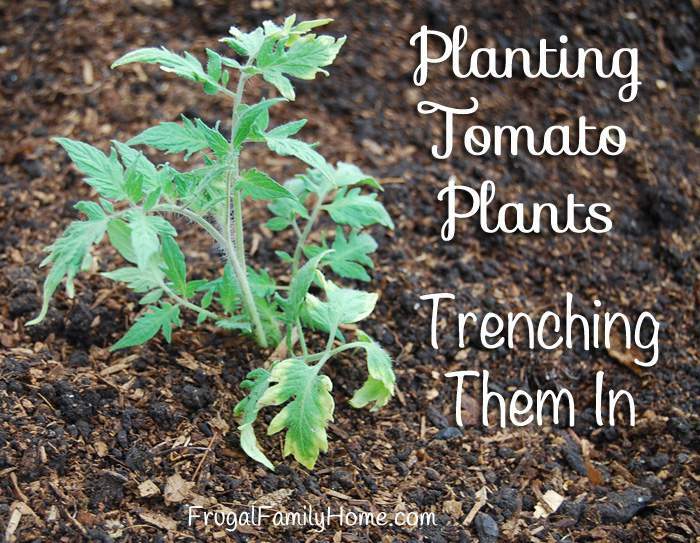 I have had really good success with my tomato plants since I started trenching them each year. 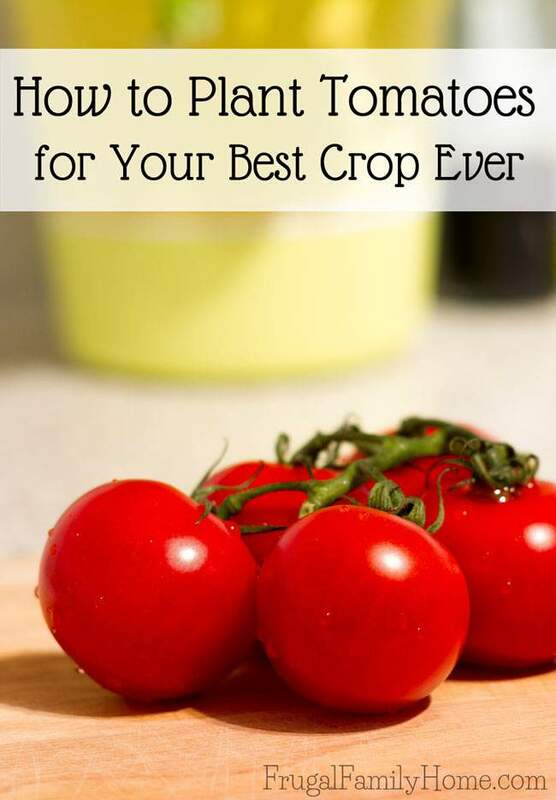 I also have learned a few other tricks when planting the tomatoes to help them grow well. First I prep the soil by adding some organic fertilizer and mix it in. Then to trench tomato plants just dig a trench about 6 inches deep and 12 inches wide. I usually plant my tomato plants side by side so I just make one long trench. 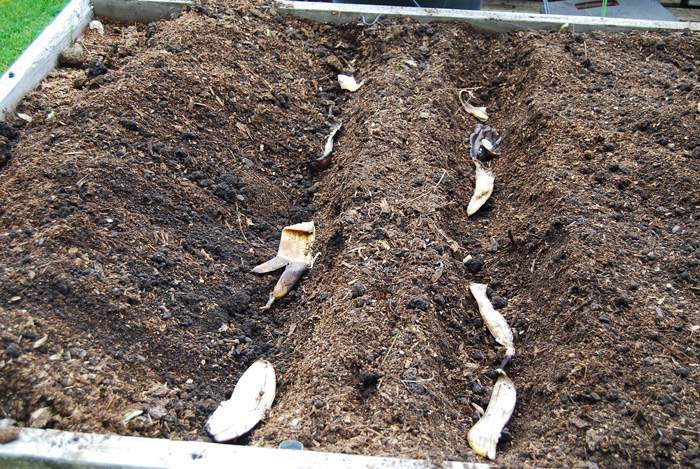 After I dug the trench I placed banana peels in the trench. Now I don’t know where I learned this trick but it is supposed to help supply the tomato plant with potassium. So I just lay some in the trench first. I left the top three-leaf stems on this one but you get the idea. 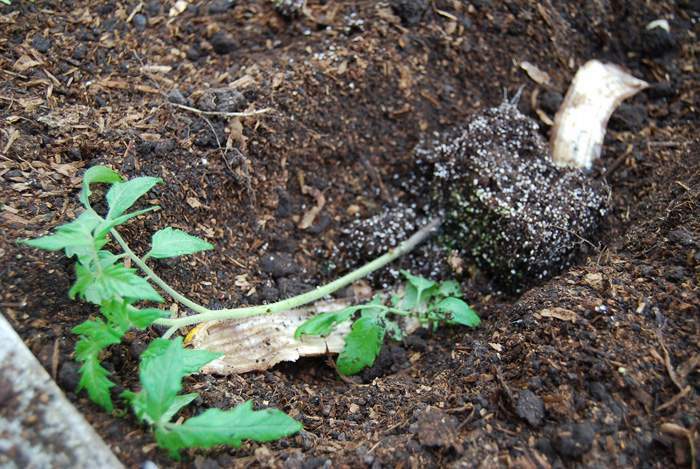 After removing the leaves I lay the tomato plant in the trench on its side. I also put the extra leaves I removed into the trench. That’s what those extra leaves are in the trench in the picture above. 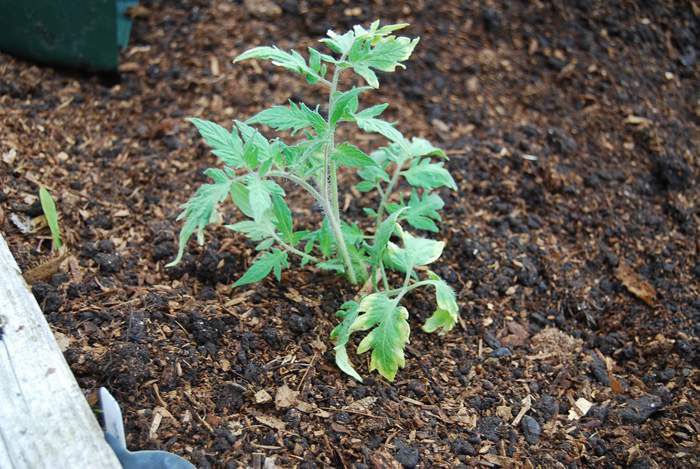 Then I gently curve the stem up and fill the trench in with soil around the plant leaving the upper leaves exposed. Now the plant is a lot shorter but the extra stem under the soil will grow more roots and help to feed the plant. I also will sprinkle powdered milk around the base of the plant to help keep blossom rot away. I have been using this technique for about 10 years now and I have had good success with it. Maybe I will get enough tomatoes this year so I can make some ketchup. 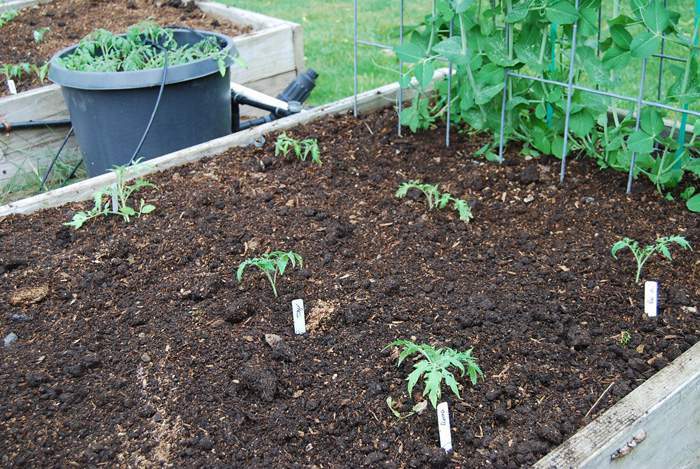 How do you plant your tomato plants? Do you trench them in? I haven’t trenched, but I have heard a lot about that. Hope you get lots of maters! Thanks Daisy, I am hoping for a good crop this year. I’ve not heard of trenching but I kind of do the same thing. I remove the bottom leaves and then dig a deep hole and plant all the way up to the remaining leaves. I really think it makes for for a stronger plant (same with trenching). I have a friend whose mom used to bury their banana peels in her potted plants. Thanks for sharing! Awesome! 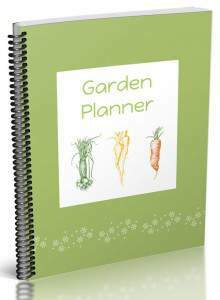 I love burying most of the stem, but I haven’t heard of bananas or powdered milk – I’ll have to try those next time I plant. 🙂 Thanks for sharing with us at the TGP! Jami, thanks for hosting TGP each week. Bananas and powdered milk. Great ideas! And your peas look great! 🙂 Stopping by from Tuesday Garden Party. Have a great week! Those are all good Ideas. Also you can put smashed eggs shell and coffee grounds in them too. Manure tea and fish are also very good. I canned 5 dozen plant in my younger days, I am 78 now, but I still can what I can. I also got the 4th of July tomatoes. If you can pay $3.99 for one, you do get them before then. Hope this has help some of you. Best wishes and Happy garden! I also add a handfull of organic fertlizer, some magnesium and basalt powder in the planthole. 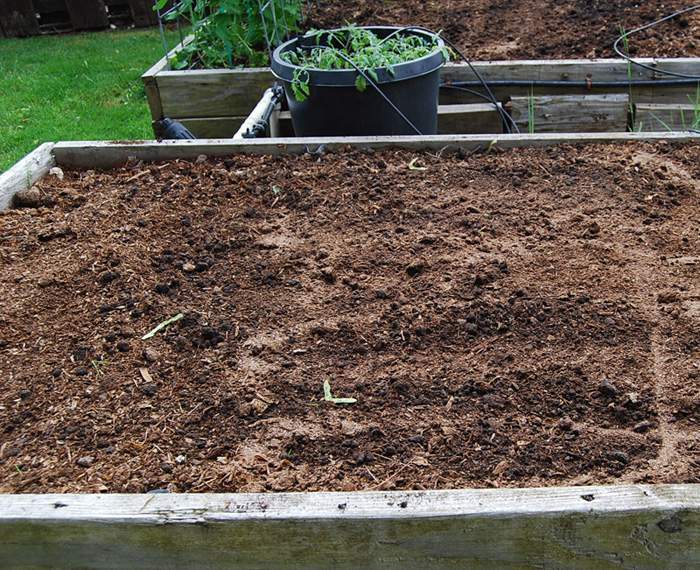 How far apart do you plant the tomatoes? What do you use to stake them? I try to space the plants about 18 inches apart. So the plant that sticking up out of the ground can be pretty close to the root ball of the previous plant. As far as supporting them I use regular wire tomato cages. I hope that helps Susan. Let me know if you have any other questions.